It used to be that people talked about dishes. Now, they talk about names. Those of you who read this blog or follow me on social media know that I have been fairly critical of the way the restaurant industry has shifted the focus away from the diner, and has, in general, devolved into a media circus. This subject is well-covered ground on this blog, so I won’t burden you with more of it here. Just read my last four or five ruminations, and you’ll get a good sense of my frustration and complaints. But let me not be that guy in cyberspace who’s always whining about something. All is not lost. There are many chefs and restaurants that are doing great things, despite the over-hype. As I confided to my friend Andreas recently over dinner in Copenhagen, I’ve found a renewed excitement in using this blog to cheer on the great experiences I have, and, more importantly, to champion those that might otherwise be lost amidst all the noise. The restaurant where Andreas works doesn’t exactly need a champion. Far from it, Kong Hans Kælder is a storied institution in Denmark. 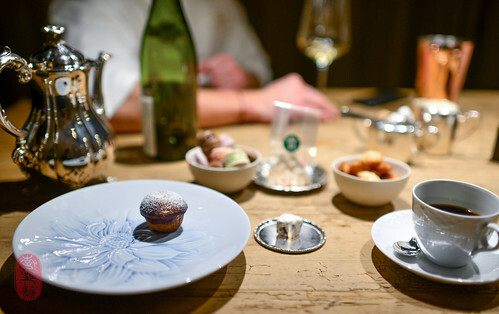 Founded in 1976 by the Grønlykke family, it was the first Danish restaurant to earn a Michelin star, a rating that it kept until 2014, when Thomas Rode, its chef of 18 years left. A new team was brought in, and with it, came a breath of fresh air. After a brief closure, Kong Hans Kælder reopened in September of last year with Mark Lundgaard Nielsen at the head of the kitchen and Peter Pepke at the head of the house. My dinner there in early March of this year demonstrated the type focus on cooking and service that I value and sorely miss. So, in the spirit of celebrating the good, I would like to tell you about it here and now, in this, my first dedicated restaurant post since I wrote about Ifuki last year (the kaiseki restaurant in Kyoto, where, as it turned out, I had my favorite meal of 2014). As I hinted above, I know the sous chef of Kong Hans Kælder. 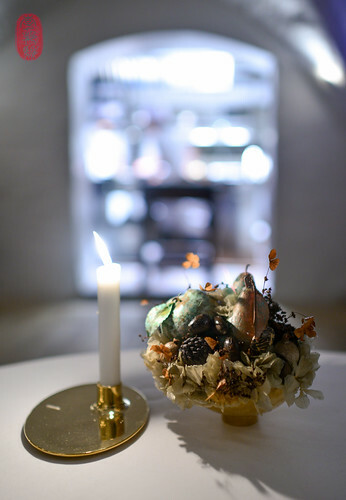 Although I didn’t actually meet Andreas Bagh until he was hired to work under Nielsen (he gave me a brief tour of the restaurant in September, 2014, just days before it reopened), I first became acquainted with him through a mutual friend, Will King-Smith, when they worked together at Rasmus Kofoed’s Geranium. Andreas and the team at Kong Hans Kælder showed me great favor and attention, and I think it’s only fair that you know about it. Chef Nielsen, offered to cook for me. He went off script, augmenting my dinner with dishes from both the tasting menu and the à la carte menu, quite a few of which were intended for two people (I was dining alone). As well, he presented me a dish that wasn’t on the menu at all. They gave me a terrific table facing the pass; poured me a glass of red wine to pair with my meat dishes (in turn, I shared with them a bottle of white wine that I had brought); and after dinner, invited me into the private dining room for a drink and a chat. When all was said and done, there was no bill. Those of you who are wary of food writers who have relationships within the restaurant industry (as you should be) know that this kind of special treatment isn’t uncommon. And I assume that most of you who visit this blog regularly know that I benefit from it, since you see the disclosures I make here (and I suspect most of my readers are affiliated with the restaurant industry anyway). However, hopefully, you also know that I am not easily wooed by such frills. At the fear of sounding boastful (but, in reality, I’m just being frank) I am treated very well in many restaurants. And the vast majority of them don’t get mentioned here on my blog. I find favor often enough that I have to believe that chefs are sincere when they tell me that they enjoy going the extra mile for guests who truly appreciate their effort and talent – without expecting any favors in return. To be considered in that category of diner is far more meaningful to me than any trick a chef could turn in the dining room. Respect is what I’m after, not platitudes. But for all the distance that effort and sincerity gain, a lack of quality undoes. To me, quality is what counts most. 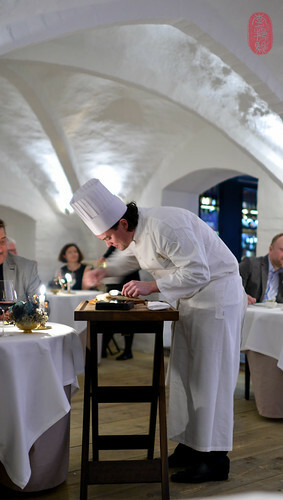 And you’ll find it at Kong Hans Kælder; a caliber of quality that is increasingly rare in restaurants these days, and the kind that inspires me write about this restaurant now. As its name suggests, Kong Hans Kælder is located in an underground “cellar.” (Kong Hans Kælder translates to “King John’s Cellar.” The Danish “d” is soft, almost to the point of being swallowed, hence sounding very much like “keller,” the German word for cellar.) Yet the name is misleading in almost every way: according to the history of the restaurant that I found on Kong Hans Kælder’s website (and other online sources), originally, this modern-day “cellar,” located in the oldest building in Copenhagen, was neither underground, nor was it ever King John’s (instead, it is merely attributed to the time of King John’s reign). But that doesn’t detract from the character of the space, which testifies to the quality of craftsmanship of a mighty era. Its low and squat groin vaulting, and especially the thickness of its frame give the dining room a distinctly medieval look, which has been softened by table skirts and the flicker of candlelight on its whitewashed walls. Given how spare the room is, lined with inelegantly thick wood planks, it’s surprisingly cozy. I think it’s beautiful. From what I understand, Kong Hans Kælder has always leaned classically French. Nielsen has not departed from this tradition. And neither has the restaurant’s manager, Peter Pepke, who subscribes to a complementary, Continental style of service. Pepke told me that, in reopening Kong Hans Kælder, his focus was on bringing service back into the dining room. And he seems to lead this charge by example. Pepke manages, yes. But he also serves. And he serves with dignity, without pandering or pampering. That’s not to say that service at Kong Hans Kælder lacks warmth, or is short in any way. But the primary focus here is on the practical needs of the diner, and not on the emotional needs of the staff. I like that. But this refreshingly simple and direct style of service relies on having a good product to sell. And Nielsen and his kitchen make it so. Unlike his more “relevant” Scandinavian peers, chef Nielsen isn’t a martyr to regionalism, preferring, instead, to pursue character and quality in his ingredients. Showcasing them in a classically French frame, he dusts off familiar subjects and paints them with renewed vigor, demonstrating that good, old-fashioned cooking is always relevant – exciting, even – if it’s done well. Here, Nielsen narrows the gap between himself and the diner, presenting dishes that not only require an understanding of the ingredients, but demand a sense of timing and presence: to my surprise, a nicely seared scallop, sliced and fanned out in its shell, was still attached to it. Realizing that the scallop had never left its home, I gently scraped each slice away, marveling at how well it had been cooked – still warm and silky on the inside, with a golden brown crust on the outside. Instead of assembling dishes, like so many contemporary kitchens do, Nielsen actually cooks them and presents them to order. This leaves little room for do-overs. 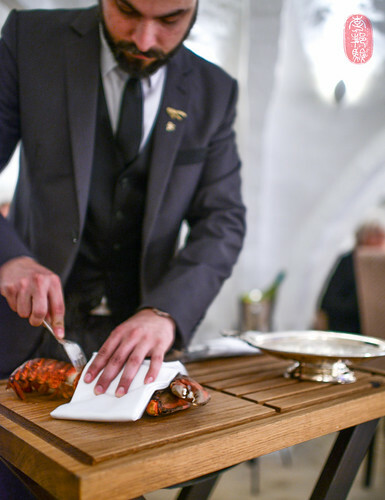 The table side presentations at Kong Hans Kælder aren’t just for show – some sauce, a garnish, or a final flourish to dazzle the common diner. Here, they serve a far more meaningful and practical purpose, an age-old rite in commercial exchange: inspect this genuine article that has been selected and cooked for you. Note the quality of the product, and the care with which it has been prepared. And watch as I personally finish it for you. Vanity? Perhaps elsewhere. Here, it is done out of respect, both for tradition and the customer. 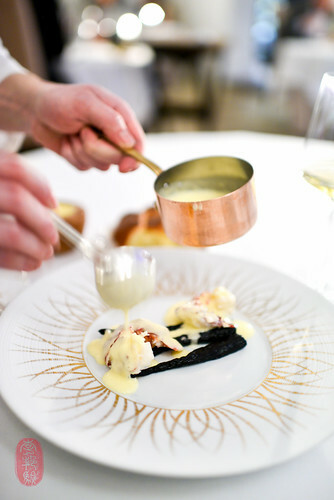 Danish black lobster (black when alive, like most lobsters, this variety blushes orange when it’s cooked), for example, arrived whole and hot. Pepke de-armored the creature before me, pulling out its fat tail, and plating it with some dried purple carrots that bled beautifully into a buttery sauce. 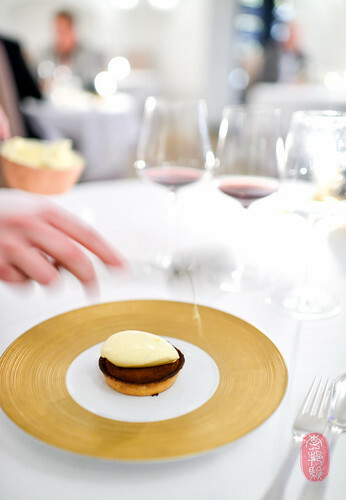 Uncapping the golden dome of a baked, salt-dough crust, Neilsen revealed a steaming tranche of turbot. He gently filleted the meat off the bone, plated it with some melted leeks, and smothered it all with velvety, white sauce. Would I like black truffles? The season was running late but strong. Or would I rather have bianchetto, a small, rusty-hued truffle that is often considered the poor man’s white truffle? The bianchetto season conveniently picks up right when the white truffle season ends in early January, and runs until spring. He would normally never buy such a second-rate ingredient, Nielsen told me. But these were particularly good, he thought. I appreciated his pragmatism and agreed with his assessment (although, I would say that, whereas I usually smell white truffles more than I taste them, the opposite was true of the bianchetto). The bianchetto magnified the grassiness of the olive oil in this lighter version of “blanquette” sauce to produce a flavor almost indistinguishable from white truffles. Nielsen told me about a peculiar method of raising lamb in Greenland (or was it Iceland?) that produces a particularly flavorful meat. It wasn’t the right season for it, so, instead of telling you about it now, I’ll hope to return for it and describe it at a later date. 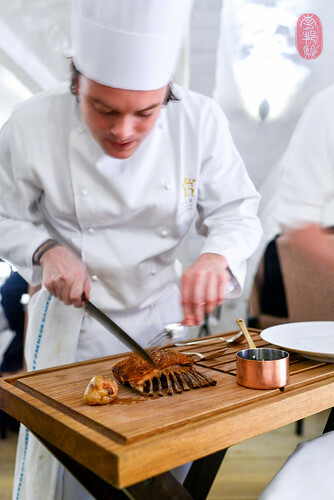 Instead, he presented lamb from the Pyrenees Mountains, a particularly small, but intensely flavorful variety. He came to my table with a rack of its ribs and sliced two of them off, and covered them with an alluring sauce of mustard seeds, preserved lemons, and whole pistachios. It was the South of France, sunny and warm, and just a bit rustic. It was delicious. On the side, he presented the lamb’s kidney, still encased in its fat. The flavor was shockingly clean. Its texture was like delicate foie gras. It was just one of the many highlights of the night. There was a trolley of cheeses accompanied by a rainbow of condiments. Every one I tried was great; especially a fragrant elderflower jelly that paired wonderfully with Brie de Meaux, and prunes macerated in Madeira, rightfully served with some Danish blue. The cheeses were also served with a dense cocoa bread choked with nuts and dried fruits. That was awesome. Following, there was a trolley of ice creams and sorbets. And finally, a dark chocolate ganache tart topped with rich, custardy vanilla ice cream. As I mentioned earlier, after dinner, I was invited into the private dining room, where I whiled away too much of the night talking with Nielsen, Pepke, and Bagh over a sprawl of sweets and postprandial drinks. * At the fear of having overstayed my welcome, I enjoyed ending the night, and my trip to Denmark, with such like-minded people, whose talents and grounded sense of purpose I admire. Together, they preserve and practice a high caliber of cooking and care that is disappearing. Kong Hans Kælder is located at Vingårdstræde 6, where it has been for half a millennium and more. Starless for now, I’m positive that it will not be starless for long. I hope to return to it soon, and often. I commend it to you. The following is the menu I was served at Kong Hans Kælder. Each course is hyperlinked to a photo of the dish. You will also find the link to the entire album at the bottom of the menu. Danish squid, lardo, Champagne sauce. Apples, ginger, and finger lime. With baby organic leeks and bianchetto truffles. With a sauce of pistachios, preserved lemons, and mustard seeds. Glazed in orange sauce, with celeriac purée. 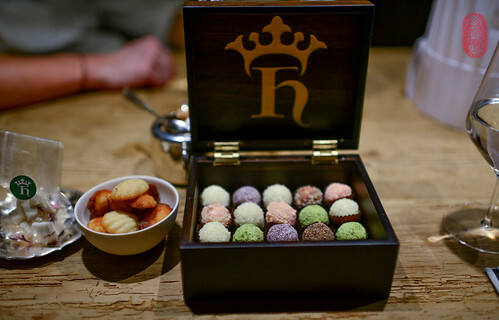 Click here to see all of the photos from my dinner at Kong Hans Kælder. * The private dining room offers a more communal experience, I was told. 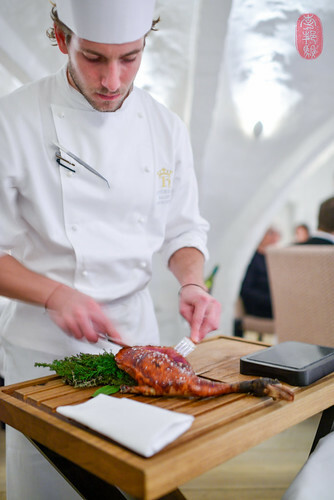 The menu for the private dining room is composed at the chef’s whim, and often centers around roasting a whole beast. There isn’t a minimum booking (I think the room seats up to 10, or a dozen at most), so diners should be prepared to share the table with strangers. I like the idea, and hope to return to Kong Hans Kælder for it. Photos: The sunken door of Kong Hans Kælder on Vingårdstræde, just off of Kongens Nytorv in Copenhagen, Denmark; candle and centerpiece on the table at Kong Hans Kælder; Mark Lundgaard Nielsen carving salt-baked turbot, table side; Peter Pepke carving a Danish black lobster, table side; a butter sauce over Danish black lobster and dried carrots; Andreas Bagh carving a glazed duck; Mark Lundgaard Nielsen carving Pyrenees lamb; the chocolate tart with vanilla ice cream; postprandial sweets and drinks; a box of truffles and a bowl of madeleines. ~ by ulterior epicure on March 30, 2015. Thanks for a great story and happy to see you writing. As a fierce cheerleader of stalwart classics, theory and technique, it is rewarding and reassuring to read praise of composed dishes at a time where the zenith of refined cookery seems to be parade of minuscule cerebral canapés that often celebrates ideas rather than substance and individual flavors trump the noble harmony of a proper ragout, braise or what otherwise passes as hopelessly dated. Seeing your picture of Mr. Kinch’s game pie from 2 yeas ago during the 12 days of Christmas was refreshing and a testament to the high-water marks of yesteryear -techniques, patience and discipline- that a few chefs still embrace and reference for inspiration, while too many value the novelty of the waning New Nordic zeitgeist.